The Caps pulled off a quiet trade yesterday afternoon, acquiring winger D.J. King from the St. Louis Blues and parting with prospect Stefan Della Rovere in the process. 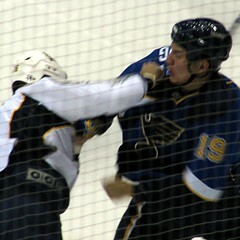 King’s a big winger at 6’3″ and 230 lbs and racked up 185 penalty minutes over 101 games with the Blues. A prolific goal scorer he is not (only 4 goals and 9 points in his NHL career), but brings some heft and grit to the Cap’s forward lines – provided he remains healthy. He only played in 13 games the last two seasons due to injuries (dislocated shoulder, broken finger). King remains under contract through the 2011-12 season. The Blues get Della Rovere, who spent most of his last four seasons playing in the Ontario Hockey League where he racked up 65 goals and 138 points across 230 games. Welcome to the Capitals, DJ!